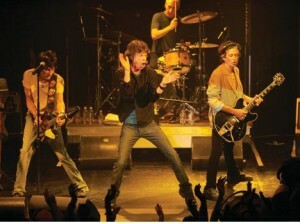 The Rolling Stones, the rock ‘n’ roll icons who have defined creativity, daring and durability, are to be chronicled in a kaleidoscopic new film that will debut Nov. 15 on HBO, it was announced today by Michael Lombardo, HBO’s president of Programming. The film documents the key periods in their career and their incredible adventures. CROSSFIRE HURRICANE, directed by Brett Morgen, provides a remarkable new perspective on the Stones’ unparalleled journey from blues-obsessed teenagers in the early ‘60s to rock royalty. It’s all here in panoramic candour, from the Marquee Club to Hyde Park, from Altamont to “Exile,” from club gigs to stadium extravaganzas. This entry was posted on Thursday, August 30th, 2012 at 9:55 am	and is filed under Film, Music, News, Television. You can follow any responses to this entry through the RSS 2.0 feed. You can skip to the end and leave a response. Pinging is currently not allowed. « October 5th, 2012 Is Officially ‘Global James Bond Day’!! !